This is the fourth installment of The immigrants’ Civil War. When Lincoln ran for election to the presidency in 1860, he had a highly developed bilingual campaign strategy. He knew that German immigrants had voted Democratic in the last presidential race and he needed to change that. The Republican Party included the remnants of the anti-immigrant Know Nothing party and Germans were repelled by the bigotry and “Puritanism” of that wing of the Republicans. If Germans went heavily for the Democrats, there was a chance Lincoln could lose in the Midwest and New York. Lincoln knew that many of the Germans were fed up with the failure of the Democrats to keep slavery out of the newly opened territories in the West. German liberals were appalled by slavery. They saw it as a violation of the liberty promised by the Declaration of Independence. Even less politically liberal Germans were against slavery’s spread. They viewed the western United States as a refuge for Europe’s displaced, and they worried that introduction of slavery into the territories would destroy labor conditions for new immigrants. Key to Lincoln’s strategy to win the German vote was to speak to the immigrants in their own language using the cultural heritage they brought with them to convince German-Americans that Lincoln understood and respected them. So, Lincoln bought a German newspaper and made sure that his campaign materials were published in German. He also convinced the still-young radical hero Carl Schurz to leave his young wife and hit the campaign trail as his apostle to German liberals. Schurz was away from home for months, but he wrote frequent intimate letters to his wife Margarethe Meyer-Schurz, whom he affectionately called “Gredel.” Gredel was an accomplished woman who had already founded the first kindergarten in the United States. Over the next month, before Lincoln’s March inauguration, Schurz heard rumors that Republican bigwigs were trying to get Lincoln to back down on the slavery question. Schurz wrote to the president-elect urging him to be a steadfast friend of liberty. 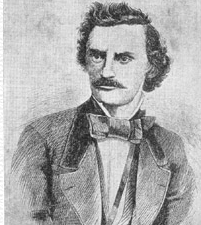 Schurz’s concern was so great that he interrupted a speaking tour to see Lincoln in Springfield just before Lincoln left for Washington. The immigrant’s powerful friend had stood firm, and the war came in a matter of weeks. Schurz’s promise five months earlier to Gredel of a tranquil family life would prove illusory as their lives, and those of millions of others, were transformed forever by the Confederate attack on Fort Sumter. 1. The Autobiography of Carl Schurz edited by Wayne Andrews published by Scribners (1961) pp, 157-178.